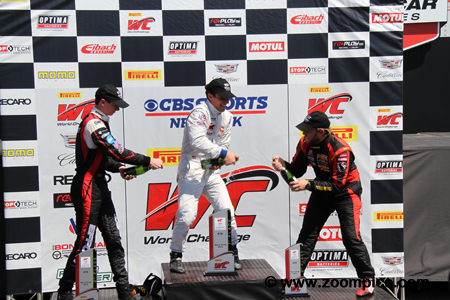 2015 was the twenty-sixth consecutive year for the Sports Car Club of America’s (SCCA) Pirelli World Challenge series. There were twelve race weekends – at some of these events, the series shared the venue with IndyCar and the United Sportscar Championship. On the other weekends the World Challenge championship served as the feature event. For the first time, the season opened in early March at the Circuit of the Americas (COTA). The second event of the season, in support of the IndyCar series, was at Saint Petersburg - in previous years St. Pete marked the start of the championship. Following Saint Petersburg were races at Long Beach, Barber Motorsports Park, Canadian Tire Motorsport Park, Detroit, Road America, Mid-Ohio Sports Car Course, Miller Motorsport Park, Sonoma Raceway and the season finale at Mazda Raceway Laguna Seca. In 2015, the series introduced two new classes – Grand Touring Sportsman (GTA) and GT Cup (GTC). Drivers and teams were now vying for titles in seven categories. Grand Touring (GT) – This is the series quickest class and is predominantly cars that would compete in the FIA GT3 category. Examples of vehicles racing in this group include: Acura TLX-GT, Aston Martin Vantage V12, Porsche 911 GT3 R, Nissan GT-R GT3, Mercedes-Benz SLS AMG GT3, McLaren 650S GT3, Cadillac ATS-V.R GT3, Bentley Continental GT3, BMW Z4 GT3, Audi R8 LMS, Lamborghini Gallardo GT3 FL2 and Ferrari 458 Italia GT3. Grand Touring Sportsman (GTA) – This class includes the same vehicles as GT. However, the drivers are not considered professionals. Competitors in this category are evaluated after each event and based on their performance may be elevated to the GT class. GT Cup (GTC) – This is a spec class for Porsche 911 GT3 Cup cars. Grand Touring Sport (GTS) – The cars in this group are similar to the GT vehicles but have additional preparation restrictions. This class is mainly comprised of Ford (Mustang Boss 302), Chevrolet (Camaro Z28) and Porsche (Cayman) products. In 2015, the GTS category witnessed an influx of new manufacturers: Maserati Gran Turismo, Lotus Evora GT4 and Aston Martin Vantage GT4. Touring Car (TC) – This class is for smaller sedans and sports cars which are allowed some performance modifications. Examples of vehicles competing in this group include: Honda Accord, Mazda MX-5, Volkswagen Golf, Nissan Altima, Volkswagen Jetta, Nissan 370Z and Porsche Boxster. Touring Car A (TCA) – Many of the cars competing in this class are the same as those found in Touring Car. What sets them apart is the minimum amount of modifications that can be made – most changes are to improve the safety of the vehicles. Touring Car B (TCB) - The slowest of all the World Challenge categories is based on the Sports Car Club of America’s B-Spec class. Examples of vehicles competing in TCB include: Chevrolet Sonic, Honda Fit, Kia Rio, Mazda 2 and Mini Cooper. 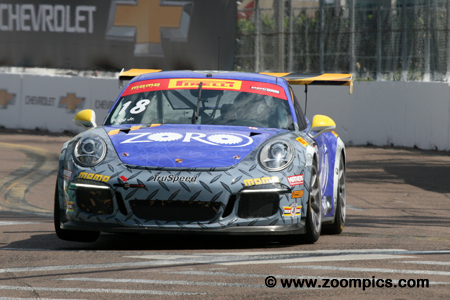 At the 2015 Firestone Grand Prix of Saint Petersburg, Grand Touring, Grand Touring A and Grand Touring Cup drivers competed in two fifty-minute races (Rounds 3 & 4 of the 2015 season) around the fourteen-turn 1.80-mile temporary street course. The start of Sunday’s race (round four) and third place starter, Olivier Beretta in the No. 61 Ferrari grabbed the lead before turn one. 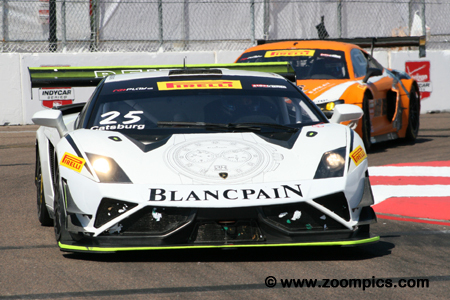 Beside Beretta is the Lamborghini Gallardo GT3 FL2 driven by Nick Catsburg. Catsburg will slot in behind Beretta for second place. Buried in the group is the pole-sitter, Andy Pilgrim who would drop fifth place before the end of the first lap. Olivier Beretta in the Ferrari of Ontario Ferrari 458 GT3 Italia qualified eighth for the weekend’s first race and maintained his position to the checkered flag. Beretta’s fastest lap during Saturday’s contest earned him the third place starting position in the finale. When the green lights turned on for round four, he jumped into first and led flag-to-flag – winning by a margin of 1.180-seconds. The victory gave Beretta the GT points lead. 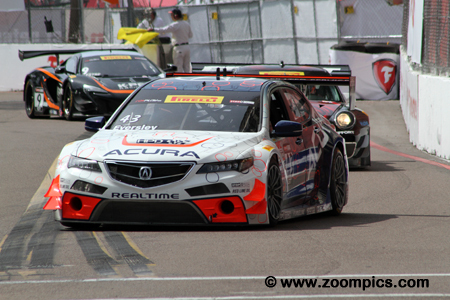 Winning the pole position for round three was Ryan Eversley driving an Acura TLX-GT. 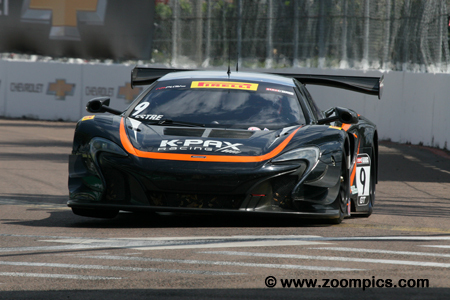 Eversley led the field into corner one with Ryan Dalziel and Kevin Estre on his tail. He was able to hold off Dalziel and a late race caution secured the victory. Eversley was eighth on the grid for the start of race two. During the contest he was passed by Johnny O’Connell but moved up two positions when Mike Skeen and J.D. Davison had their incident - Eversley finished seventh. A major incident occurred on the starting grid when GTA competitor, Henrique Cisneros stalled his Ferrari 458 GT3 Italia. 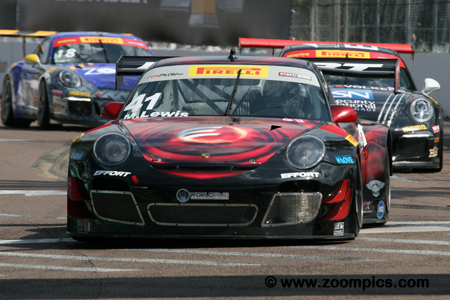 Several cars were severely damaged including the GT Cup pole-sitter Colin Thompson. In the weekend’s second event, Thompson fared much better. The driver of the No. 11 Porsche GT3 Cup started race two from the pitlane due to a penalty received in Saturday’s event but caught the class leaders and took the victory. In the center of the podium, celebrating Sunday’s Grand Touring A win is the driver of the No. 66 Bayshore Racing Mercedes-Benz AMG SLS GT3, Frankie Montecalvo. On the left side of the podium is second place finisher and round three winner, Michael Lewis. 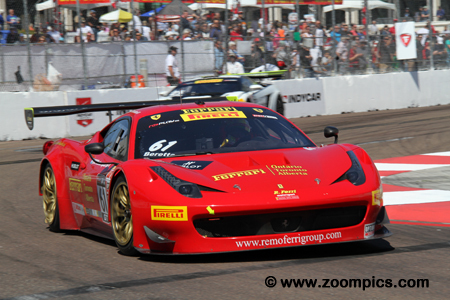 Completing the podium is Henrique Cisneros who drove the MOMO-sponsored Ferrari 458 GT3 Italia. In Saturday’s race, GTA point’s leader, Michael Lewis inherited the class lead when Marcelo Hahn slowed with a mechanical issue. Lewis maintained first place in the GTA category for the remainder of the race and finished twelfth overall. In the weekend’s final event, he started second in the GTA - seventeenth overall. Lewis gained four positions during the contest and was the GTA runner-up at the checkered flag. 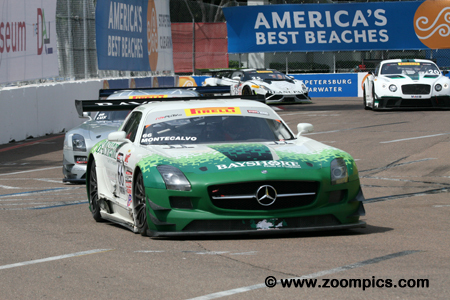 In race one, GTA competitor, Frankie Montecalvo driving the Bayshore Racing Mercedes-Benz AMG SLS GT3 started twenty-sixth overall and moved up twelve positions. This accomplishment earned Montecalvo the VP Racing Fuels Hard Charger Award. In the weekend’s finale, he started and finished eleventh overall and captured the category victory. Driving the No. 9 K-PAX Racing McLaren 650S GT3 was McLaren GT factory driver, Kevin Estre. In the weekend’s first race Estre started on the outside of the front and was in third place by the end of the first lap. On lap-16 while in fourth place, he made an error which allowed Nicky Catsburg to pass – Estre would finish fifth. Round four produced better results as he started fourth and grabbed the final spot on the podium. Starting in the seventh grid position for race one was Mike Skeen. Skeen worked his way up the race order and passed Johnny O’Connell for third on lap-12. He was in third place at the checkered flag. In the weekend’s finale, the driver of the No. 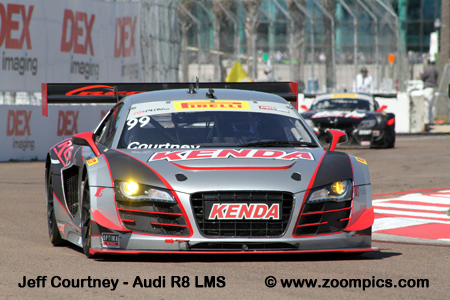 2 Hawk Performance Audi R8 LMS Ulta started sixth and was running as high as fourth but contact with J.D. Davison caused Skeen to spin and finished the race in the twenty-sixth position. A major starting line accident in round three led to the retirement of two of the quicker GT Cup cars – Colin Thompson and Alec Udell. On the restart, Phil Fogg Jr. racing the TruSpeed Porsche GT3 Cup assumed the class lead and went on to win the category. On lap-1 of race two there was a serious incident and this time Fogg was one of the victims. His car was too badly damaged to continue racing. 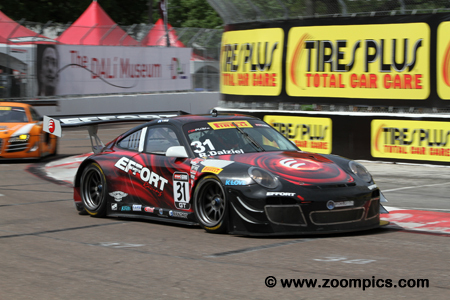 Qualifying third in the weekend’s first event was Ryan Dalziel in the EFFORT Racing Porsche 911 GT3R. 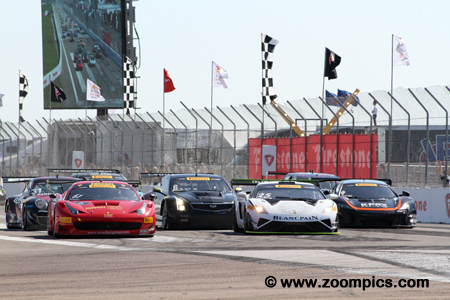 When the lights turned green, Dalziel tucked in behind the pole-sitter Ryan Eversley to secure second place. He challenged Eversley but was unable to pass and finished second. 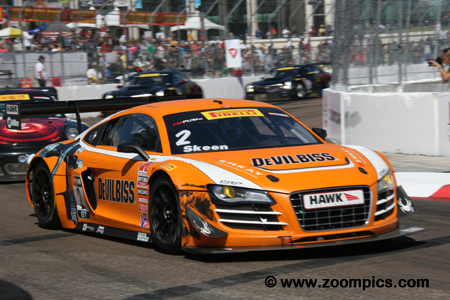 Dalziel started race two in the seventh position and was in fourth at the checkered flag. He left Saint Petersburg second in the GT standings. In the Saturday’s contest, Andy Pilgrim driving the No. 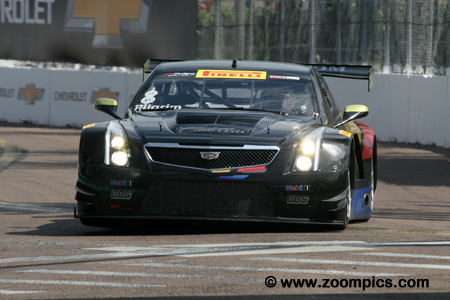 8 Cadillac Racing Cadillac ATS-VR GT3 started tenth and finished ten but in the process recorded the fastest race lap. This honour gave Pilgrim the pole positon for round four. In race two, he was overtaken before corner one by eventual winner Olivier Beretta and Nick Catsburg. At turn two, Ryan Dalziel and Kevin Estre went by – Pilgrim would finish in sixth place. Nicky Catsburg started race one from the ninth position on the grid. By lap-16, Catsburg had moved into fourth place but problems dropped him to a seventeen place finish. In Sunday’s contest, he followed Olivier Beretta through the first corner and assumed second place. Kevin Estre in the K-PAX McLaren passed Catsburg early in the race but Catburg retook the positon. The move earned him Invisible Glass Clean Pass of the Race Award and a second place. 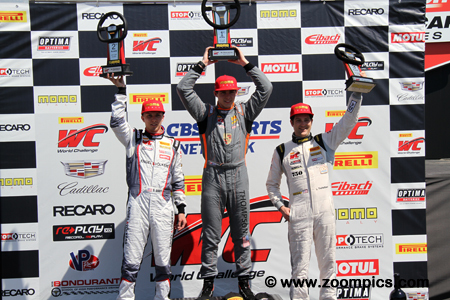 The round four podium for the GT Cup competitors. On the right side is third place finisher Lorenzo Trefethen. It was a good weekend for Trefethen, in addition to his third, he earned a second place in the weekend’s first race. 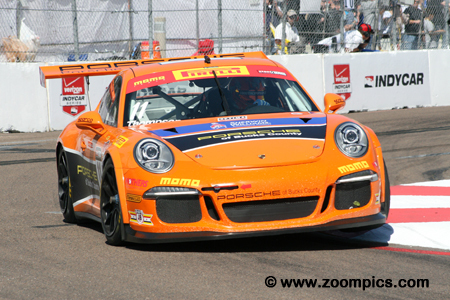 Runner-up, Sloan Urry – the driver of the Engel & Volkers sponsored Porsche is on the left. In the center is the points leader and race winner, Colin Thompson.